Southeast Asia by way of Australia in the West Village. : Australian chef Adam Woodfield does an admirable job at this Southeast Asian eatery in the West Village. Located down leafy Grove Street, the dark-hued wood-accented space is a nice venue for the large sharing plates that are served here. The salt and pepper soft shell crab manages to avoid being greasy, leaving the diner to savor the taste. 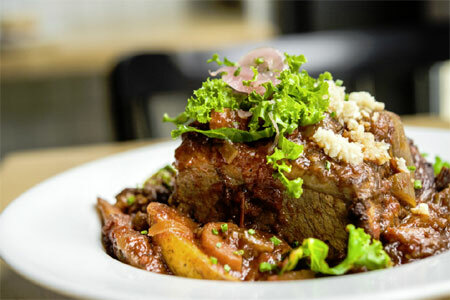 The dinosaur-size caramelized beef rib (served with a spicy chili sauce) is fall-off-the-bone tender while the jungle curry of snapper (accompanied by fried garlic, onions and beans) is as complex on the taste buds as it is memorable. The long cocktail list is just as creative: the Ginger Manuka (bourbon, honey vodka, yuzu, ginger ale and lime) and the Gala (apple vodka, Cinzano Bianco and lime) are decadent accompaniments to an above-average meal.